Scheduled copy and transcoding jobs can be reordered and suspended since Silverstack version 6.2. This functionality gives you full flexibility to maintain an optimized task order at any point. The “Queue” column indicates the order of the completion of jobs. Jobs in a queue will be completed from top to bottom. Running jobs are always on top. Copy jobs are generally scheduled into the main primary copy queue where they will be executed from top to bottom. 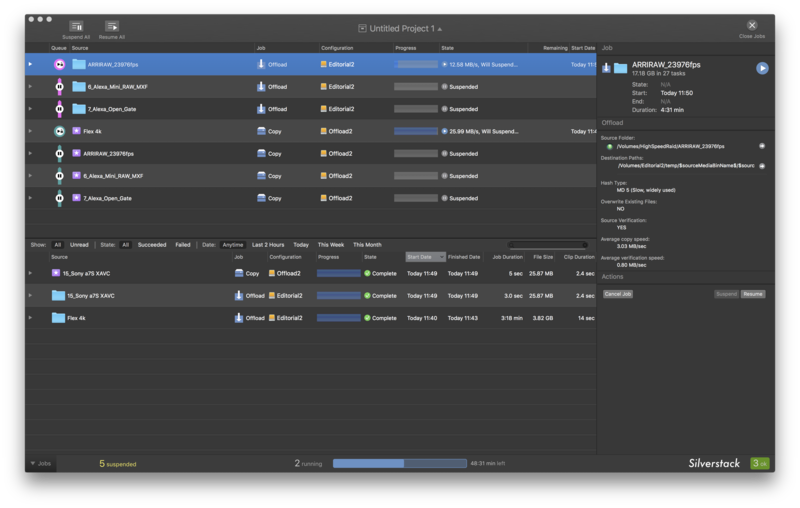 You can set the number of parallel jobs for the primary copy queue in the preferences. Please see the article Multiple Simultaneous Copy Jobs in Silverstack for more information about the general copy preferences. The secondary copy queue holds “Second Run” jobs from Cascading copy jobs. Learn more about Cascading copy jobs in the article Cascading Copy. Enabling a separate queue for “Second Run” copy jobs will automatically schedule them into the secondary copy queue. Learn more about the independent execution of “Second Run” copy jobs in the article Cascading Copy Preferences. The transcoding queue holds all transcoding jobs and will also be executed from top to bottom. 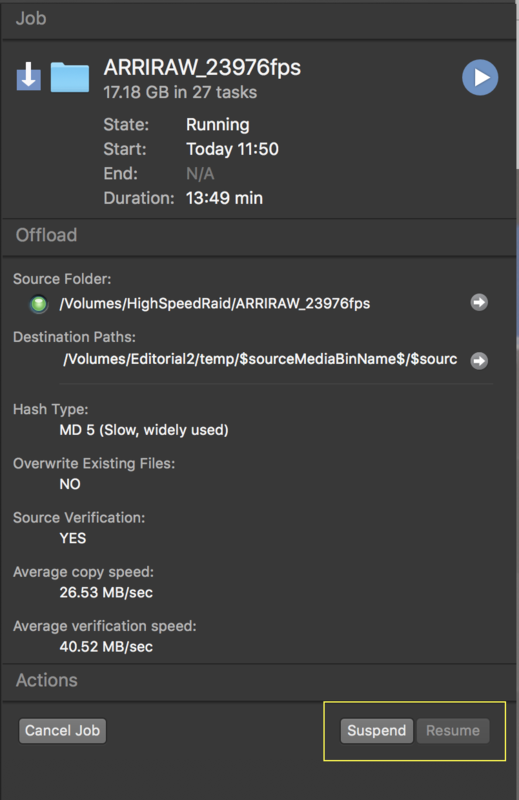 Please see the articles Transcoding in Silverstack and Silverstack XT or Transcoding in Silverstack Lab for more information about transcoding. Terminated jobs are not anymore a part of a copy queue. They will be automatically moved to the second table view in the lower half of the jobs window. Suspended jobs cannot be reordered above waiting jobs. They stay at the bottom of the queue and will not be executed until they are resumed. Waiting jobs cannot be reordered above running jobs. Suspend running jobs for the next job in the queue to start. Suspending a job will stop the job after the next task (often being the next file) is finished. This enables the prioritization of an incoming job and avoids loss of copy or transcoding progress. To resume the job again click the “Resume” button. When resuming a job it will again be queued with its former priority. Suspended jobs are still visualized at the bottom of the queue but will not be executed. Cancelling a job will immediately stop the job and move it to the terminated jobs at the lower half of the jobs window. The copy progress of the current task/file will be lost, the copy progress of completed tasks/files is preserved. Cancelled jobs can be re-queued and will continue the copy process after the last successful task/file.